The restyled 2014 Chevy Camaro line is out now, and adding to the fanfare is the return of the legendary Chevy Camaro Z28. Aggressive design and raw power are familiar hallmarks of the new models, while new perks include ultra-lightweight bodies, increased stopping power and better grip around corners. Chevy Camaro drivers in Phoenix can choose from the track-ready Z28, the speedy ZL1 and standard Camaro. Early Chevy Camaro reviews show each model to be quite a bit more advanced than their predecessors, and that sentiment rings true both inside and out. Shoppers in Phoenix considering a new Camaro can expect to find a lower, wider front and rear body style with a modern look and feel, along with interior accents like Recaro seats and suede inserts. 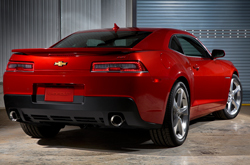 For this year's sport-oriented models, the ZL1 and all-new Z28, engine power is at its prime. Each features an LS7 engine with estimated horsepower output between 500 (Z28) and 580 (ZL1). That should be enough to blow the doors off anyone on the road and then some. The real story with the Camaro line in 2014 is the reintroduction of the Z28. Since 1967, drivers across the country have loved this iconic piece of Americana, and for good reason. Few other cars in our cultural zeitgeist stand toe-to-toe with this titan of the track. And now, after a long hiatus, it's back and ready ride forth once again. Chevy anticipates a limited run, so don't be the only guy in Phoenix who misses his chance to purchase this revitalized phenomenon. When you compare Chevrolet's new 2014 Camaro against the 2014 Hyundai Genesis Coupe, Nissan 370Z, Dodge Challenger and the Ford Mustang, we're sure you'll realize that the Camaro is ideally suited for you. 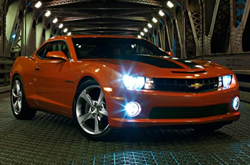 With progressive incar technologies and an handsome design, shoppers will love the Camaro. When compared to the aforementioned vehicles, in terms of price it's clearly a fabulous value, making it a first choice among Chevrolet customers in Phoenix. Look through our Camaro Facts list; look just below this paragraph for bullets. Thank you for selecting Midway Chevrolet as your source for 2014 Chevrolet Camaro reviews. We're a top-rated car retailer in Phoenix for a reason, part of which is that we provide reviews authored by experienced writers who are at the height of their craft. Want to know about the 2014 Camaro's cargo capacity and other specs? As your Chevrolet retailer, you can count on us for factual information. Is the Camaro not the right model for you? Discover more about other vehicles on the lot at Midway Chevrolet using our reviews gallery. With it you can review and compare Chevrolet's entire series of vehicles.